Not one person watching the game looked away or left the room when Gronk caught that touchdown pass. We were all focused on the first spike of the season. 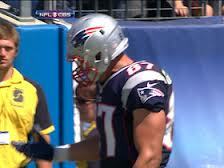 I’ve got to be honest, I was left almost as speechless as Gronk was when he let the ball slip out of his hands. I felt almost as if the touchdown didn’t count. Regardless, that will be one of many touchdowns from Gronk this year so it just puts that much more pressure on the next spike. I’d put money on the ball deflating. Stay tuned New England. This entry was posted in Patriots and tagged boston sports blog, gronk, Gronk'd, new england patriots, rob gronkowski, Spike by jtulz07. Bookmark the permalink.